Review: News reporters work hard to find out the meaning of a final speech that an important publishing tycoon gave just before he passed away. One of the best films of all time. Herman J.Mankiewicz and Orson Welles got an Oscar in 1941 for Best Writing, Original Screenplay. When this film came out in the cinema it was a huge box office flop. Everytime it was read out at the Oscars for a nomination it was booed. In 1998 this was voted #1 greatest American Movie of all time by The American Film Institute and again in 2007. 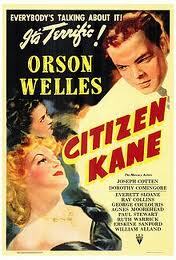 The film was originally going to be called “American” and then changed to “John Q” but was then at the last minute changed to “Citizen Kane”. The script copy sold for $97,000 in 2007. It was 156 pages long. This is Orson Welles’ first feature film and he was only aged 25. This is on Barry Norman’s list of 100 Greatest Films of all time that he produced at the start of 2012.